Each year, we bring together a diverse, talented and community-minded group of Jewish young adults who learn and give together to make a difference in the Greater Denver community. Roots & Branches Foundation members begin their collaborative philanthropic journey by participating in a six-month program where they explore Jewish values, learn about community issues, and put the tools of strategic philanthropy to work, ultimately granting up to $50,000 together. Joining Roots & Branches means becoming part of the next generation of funders at Rose Community Foundation and joining a network of nearly 200 program alumni who continue to gather to celebrate holidays, volunteer, learn, give and make new connections. Applying to participate in Roots & Branches Foundation is a two-part process: a written application and an informal, informational interview with an alum of Roots & Branches. The 19 members of Roots & Branches Foundation 2018 are a diverse and talented group of young Jewish adults. Members of Roots & Branches Foundation meet for six sessions over six months, from July through December. Rose Community Foundation staff supports the group and facilitates its meetings. 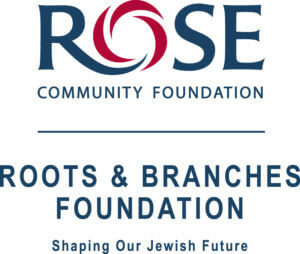 Since 2007, Roots & Branches Foundation has granted more than $729,000 to strengthen the Greater Denver and Boulder Jewish and broader communities. With more than 180 alumni, the Roots & Branches Foundation network includes a diverse group of Jewish young professionals.